trying to get it to lock up again. I just tightened the screws down. ill post a screen shot of the correct profile device manager here in a minute. well it looks like the problem was my deck screws were not tight enough. i cant seem to get it to lock up again and im getting dizzy lol. Thanks for the fast help, sorry for the noob question and using the wrong profile. I see that lol, they were pretty tight but one of them I was able to snug up a bit. I'll run the analyzer here in a few hours my batteries should be down to 25% by then. Is the case analyzer a one time thing or do I need to run it every so often? well I spoke too soon just hit it a few more times and its doing it again. 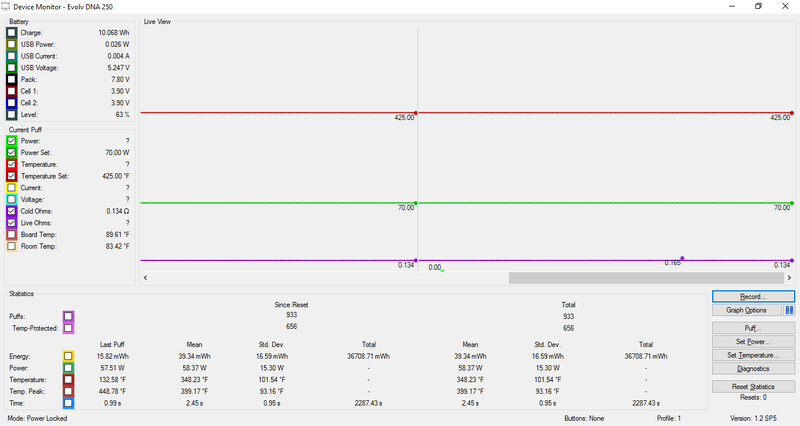 here is a screen shot of the device monitor. Im starting to think its my avocado 24 thats causing this problem. I threw on my fuji gta, hopefully its just that rdta. Yea, im gonna vape on this fuji to see if i get the same problem while I check the avocado. Im hoping its the 510 pin and screw because thats my favorite tank and i dont want to have to stop using it. Any rdtas you would reccomend?